I used 3/8″ i.d. copper coil for the sparge arm so I could get it in the geometry that I wanted. This fitted into 1/2″ stainless steel compression fittings where a 1/1.5″ sanitary triclover is attached. Giving it a ‘hump’ allows it to be raised or lowered several inches as depending on your brew and mash thickness, your grain bed will fluctuate. 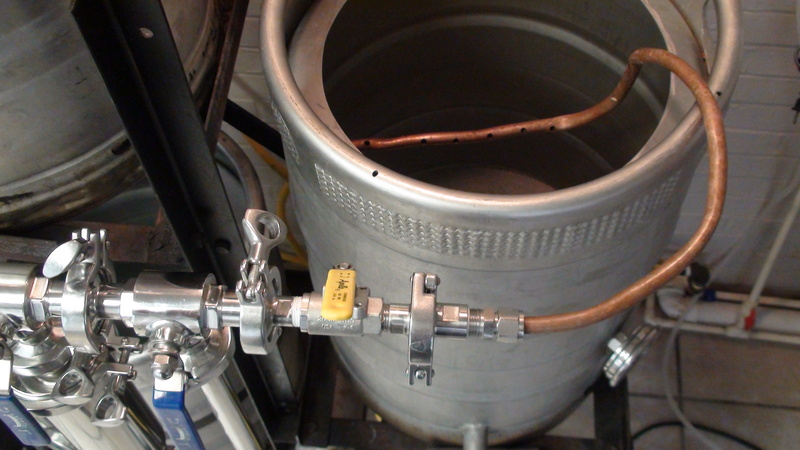 During RIMS you want the sparge arm BELOW the liquid line in the mash-tun to avoid aeration at this stage. 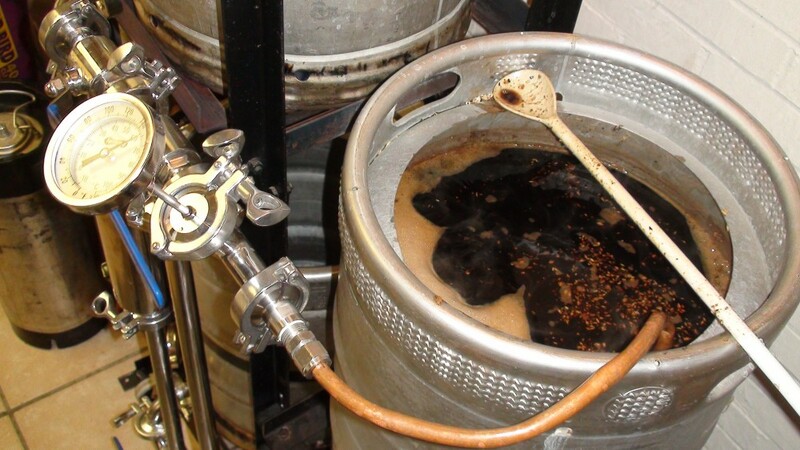 During sparging, it doesn’t matter. I ended up drilling some holes, about 3/8 inches wide along the length of the straight part, as there will be grain that escapes the false bottom and recirculates. The holes that big gives them a chance to not get stuck. If you are mimicking this system exactly, you do need the one way valve (yellow handle) right in front of it as the 3-way valve will not work to reduce your sparge water flow from the top-most boil kettle. Mashout, taking your grains from ~145/150 degrees to 170 degrees via the RIMS takes about 20-30 minutes heating the mash tun during recirculation. Sparging takes about 30-45 minutes from beginning to the very end of the run-off. I have the sparge water @ 170 degrees in the top left boil kettle going slowly into the mash tun via the pictures below. I am collecting wort into the lower-left kettle (the Grant) which I have the burner on and heating up. Once I collect about 9 gallons, I temporarily stop the sparge and pump of the wort to the boil kettle (as there is no more sparge water in it). I heat if up as it’s already close to boiling and collect the last few gallons in the grant and pump up to the boil kettle one last time. Note, once you are done collecting all our wort, your wort is going to be about boiling temperature anyway since I had burners ‘on’ for the grant during the collection.